The What: Yamaha console users can now access Stage Tec's NEXUS system over IP in conjunction with the Dante interface. Yamaha consoles can control NEXUS microphone inputs and can use the NEXUS converters. The What Else: With the TrueMatch microphone converter, NEXUS offers AD/DA converter technology at an internal resolution of 32-bits and a dynamic range of 158dB (A), eliminating the need for microphone preamplifiers. 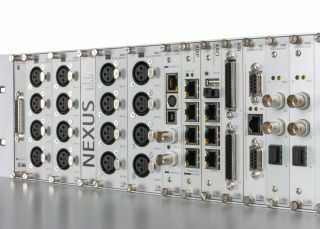 NEXUS requires the Dante audio-over-IP interface XDIP and the control board XACI for this interaction. A Dante board provides up to 64 channels. Up to four Dante boards can be used per mixing console. This IP-based variant replaces the serial modification (via MADI and NEXUS XCI). The Bottom Line: Yamaha has expanded Dante device support with the latest update of the CL/QL series of mixers. Yamaha mixing consoles can now be accessed over IP in Stage Tec NEXUS routing systems to control the parameters of the TrueMatch microphone inputs (phantom power, low cut, and gain). The license for NEXUS remote control by Yamaha mixing consoles must be purchased from Stage Tec.